Elgi Equipments, the second-largest player in the Indian air compressor market and a leader in the reciprocating compressor segment is not happy being a 'big fish in a small pond'. So, it is mastering the technology, tweaking its production processes and quality levels to foray into the global market. N. Madhavan reports. Jairam Varadaraj is a man in a hurry. 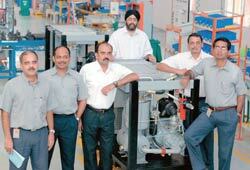 The Managing Director of the Coimbatorebased Elgi Equipments (EEL)—Jay to his colleagues— heads a company that is the second-largest player in the Indian air compressor market; it is also the market leader in the reciprocating compressor segment, and exports its equipment to over 50 countries. But, being a dominant player in the Rs 1,500-crore Indian market doesn’t excite him. He has set his sights higher: his goal is to become a global player and increase Elgi’s trivial share in the Rs 36,000-crore global market within the next seven years, and achieve a top line of Rs 4,000 crore. In line with this, EEL is establishing beachheads in various corners of the world. In August this year, the company’s Chinese facility, located at Jiaxing, 100 km from Shanghai, will commence operations. “With a market size of $1.4 billion (Rs 6,020 crore), China is the largest and fastest growing compressor market in the world. Elgi China will initially cater to the domestic market in that country and later look at exports,” says Siddharth Shrivastav, General Manager, Elgi China. It will face stiff competition there. Deep-pocketed multinationals like Atlas Copco, which is the market leader in India, Ingersoll Rand, Sullair, CompAir and Kaeser Kompressoren are already entrenched there. Then, there is a host of local companies as well. But, EEL has its game plan chalked out. “We will position ourselves as a service-oriented company and work towards becoming one of the top 10 players in that country over the next decade,” adds Shrivastav. Over the next five years, the company expects China to account for 10 per cent of its global revenues. Then, later this year, the company will commence warehousing operations in Brazil as a prelude to the launch of a full-fledged assembly facility that is expected to start operations by the end of 2009. “Brazil is an attractive market. We will also use it as a base to tap demand in neighbouring countries such as Chile, Colombia and Argentina,” says M.S. Anand, Regional Head (Americas), at the company. EEL is also planning to set up a warehousing facility at Sharjah. “The world air compressor market is growing at 6 per cent per annum and offers excellent scope for growth. Our offshore facilities will help us cut costs, lower freight charges and reduce delivery times substantially,” says V.T. Govindarajan, Director (Global Business), EEL. Adds Varadaraj: “By 2015, we expect our turnover to be around Rs 4,000 crore. Of this, Rs 3,000 crore, or 75 per cent, will come from outside India.” The comparable 2007-08 figures were Rs 451 crore, Rs 71 crore and 15.75 per cent, respectively.